Wouldn't you rather have your Children Discover Puccini, Schubert, Strauss, Wagner, and Tchaikovsky.........Rather than see that Antonio guy? Texas' choice for the man behind the mask is handsome New York City Opera baritone Richard White, who takes the title role when Theatre Under The Stars' Zorro: The Musical premieres in August on stage at the Brown Theater of Wortham Center. Previews began August 13, with regular performances starting August 19 through August 30, 1998. Based on the magazine serial "The Curse of Capistrano" by Johnston McCulley, the musical adventure is co-authored by Jim Bernhard and Frank M. Young, with original lyrics by Jim Bernhard and Randy Rogel. Original music is by Randy Rogel, with other musical themes borrowed from such classic composers as Bizet, Debussy, Dvorak, Schubert, Puccini, Tchaikovsky and Wagner. The third and most ambitious new work to be mounted by TUTS this season, Zorro is described by its authors as a "new 1920's-style operetta created in loving hommage to Naughty Marietta, The Student Prince, The New Moon, The Desert Song, Rose Marie and all the wonderful operettas of old." 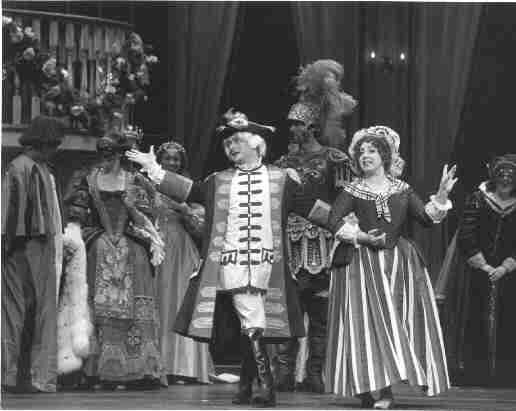 governor; Carole Swarbrick as his wife, Dona Elena, Michael Cousins as Miguel; Rosalia Villard as Carlotta; and Jason Douglas as General Santa Anna. Featured as the obligatory comedy duo stumbling in and out of danger are Randy Rogel as Willard and Lillian Graff as Wilma. Principal fighters are whip master Scot J. Mann and fight captains Leraldo Anzaldua, Jason Kehler, Mike Mahaffey and Ryan John Spickard. The musical is directed by Frank M. Young with musical staging by Michael Tapley, music supervision by Wayne Green, music direction by Allen Grubbs and orchestrations by Don Elam. Conductor is Richard Short. Playwright and lyricist Jim Bernhard previously wrote the book and lyrics for three other musicals produced by TUTS - Sir Jack!, Scrooge and Ninfa! His plays and musicals have been produced at such Houston theatres as Playwright's Showcase and the Tower Theatre, and his crossword puzzles have appeared in many national publications. A renowned Houston arts administrator, Bernhard is the former general manager of both Society for the Performing Arts and Theatre Under The Stars and served as interim artistic director of both the Alley Theatre and Stages Repertory Theatre. He is currently TUTS' director of special projects and guides TUTS' collegiate internship programs. Co-author Frank young, TUTS' founder, president and CEO since producing, directing and conducting TUTS first production in 1968 has guided the company through 30 seasons of more than 200 musicals. In all, his TUTS career as a playwright, producer, director, and choreographer and / or conductor now includes 28 Houston premieres, two U.S. premieres and nine world premieres. His combined operations at TUTS and Seattle's 5th Avenue Musical Theatre, of which he is Executive Director, boast a subscription base of 65,000 subscribers from eight states and Canada. He has received commendations from President George Bush, Texas Governor Ann Richards, five Houston mayors and the mayor of Seattle. Composer and lyricist Randy Rogel is a three-time Emmy Award winning writer. Now a full-time television and film writer under contract to Warner Brothers (who were kind enough to allow him time off to do this show), he received a rare and prestigious Peabody Award for his work on Steven Spielberg's Animaniacs, for which he wrote many of the scripts and songs. Warner Bros. has also released three albums containing Randy's songs. A writer of the original Emmy-winning Batman animated series and screenwriter for two Batman videos released in conjunction with Warner's most recent live action Batman movie, Randy also wrote 18 songs for Disney's CD-Rom interactive video of 101 Dalmatians. As a performer, Rogel is the quintessential "triple threat" singer-dancer-actor hailed by critics for his fearless physical comedy and impeccable comic timing. He previously starred for TUTS as Henry in Makin' Whoopee!, Snibson in Me and My Girl and Cosmo in Singin' in the Rain. 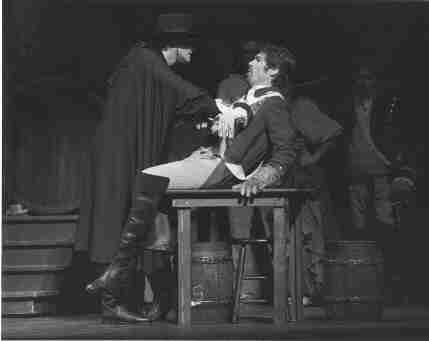 Richard White was most recently applauded at Miller Theatre in TUTS' production of Larry Gatlin's musical, Texas Flyer, before donning the mask and cape of Zorro. 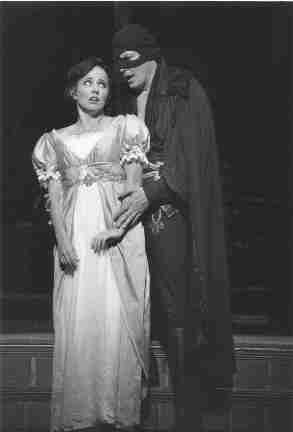 As TUTS' perennial "man behind the mask", White was the dashing Red Shadow in The Desert Song in 1986 and created the title role in TUTS' World Premiere production of Arthur Kopit and Maury Yeston Phantom (Premiere Cast Recording available on RCA Victor) in 1991, reprising that role here in 1997. He toured the country as Lancelot in Camelot with Robert Goulet, made his Broadway debut as Joey in The Most Happy Fella and appeared Off-Broadway in Elizabeth and Essex opposite Estelle Parsons. He has been a favorite leading man throughout the years with New York City Opera in productions of Brigadoon, South Pacific, and The Desert Song. His starring performances in Show Boat and NYCO's The New Moon have been featured on PBS Great Performances. He has appeared at regional theatres across the country and has been a guest soloist for numerous concerts including a recent engagement at the Hollywood Bowl in Los Angeles. To children, Richard is probably best known as the villain Gaston in Disney's Academy Award-winning animated film, Beauty and the Beast. Next fall, he will appear as Dr. Jekyll in a new musical version of Dr. Jekyll and Mr. Hyde for Paper Mill Playhouse. Susan Powell, who also starred for TUTS recently in Texas Flyer, is the television host of Home Matters, seen nationwide daily on The Discovery Channel. In September of 1980 the Elk City, OK, native was named Miss America in 1981 and in the years following her reign, she has starred in theatres, opera houses, and concert halls across the country in roles ranging from Micaela in Carmen and Julie Jordan in Carousel to Eliza Doolittle in My Fair Lady. Miss Powell made her operatic debut as Adele in Die Fledermaus at Seattle Opera and made her debut at New York City Opera as Johanna in Harold Prince's production of Sweeney Todd. and Hammerstein, The Desert Song, Show Boat, and The Music of Andrew Lloyd Webber. Her other theatrical work includes starring roles at Paper Mill Playhouse, Sacramento Music Circus, Pittsburgh Civic Light Opera, Dallas Summer Musicals, Theatre Under The Stars (Guys and Dolls, Cinderella), St. Louis MUNY and Cape Fear Regional Theatre. She is also featured on the Cast Recordings of Olympus On My Mind, and Fifty Million Frenchmen. 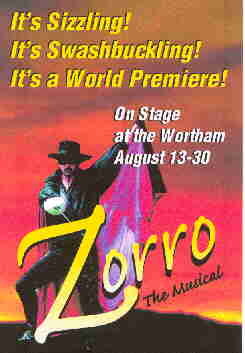 Single tickets for Zorro: The Musical (base price $14 to $55) are on sale by phone at 800-678-5440 or at TUTS' box office at Corporate Square One, 2600 Southwest Freeway (off Kirby), and the Wortham Center Box Office. For other ticket outlets, call 888-FIND-TIX. For Group Discount (party of 15 or more), call David Greiss at 713-558-2600, ext. 4052.